My husband and I go to different 5k runs every year. This year I was invited to go with my friends from my Buddhist organization so I didn’t want to pass up the opportunity to exercise and have fun. I used to enjoy going clubbing when I was younger, but now my hobby is going on 5k runs. It’s healthy and no alcohol is involved to loosen up and have fun! I never prepare for these runs except for getting cute outfits to run in. Here is the link to color run. It is much cheaper to join a team or group where you can get a discount and signing up early. Apparently, these runs are all over the world. 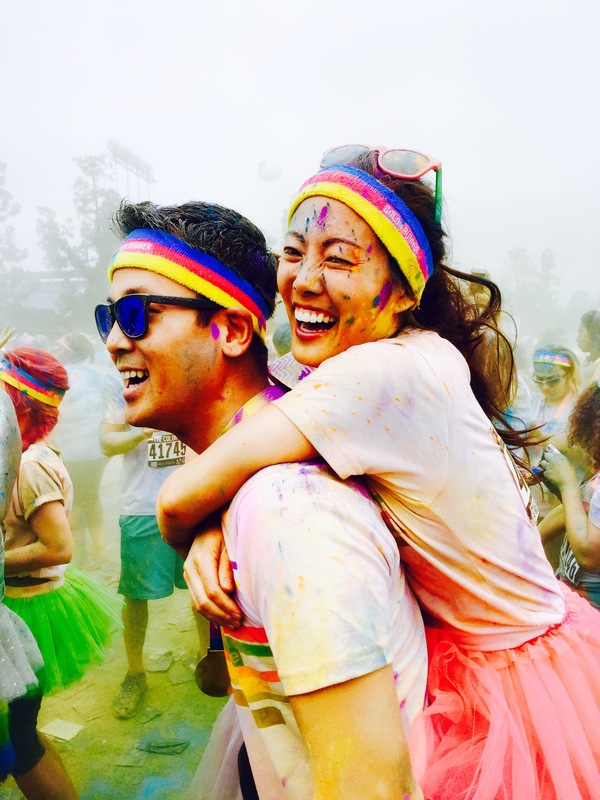 Who knew people from different cultures enjoy being thrown color powder all over their face and body! The check-in process on the same day of the run was not too long. 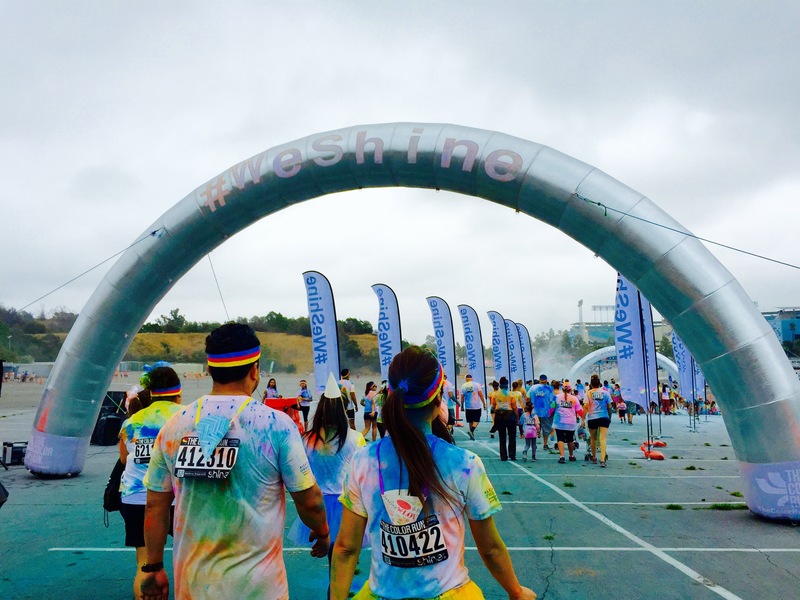 We saw that many people had already checked in for the run on a different day so they wore the official color run T-Shirt, headband, tattoo, etc. when they arrived in the morning. There were 2 different times for the run. We signed up for the morning run that started at 8:15am. 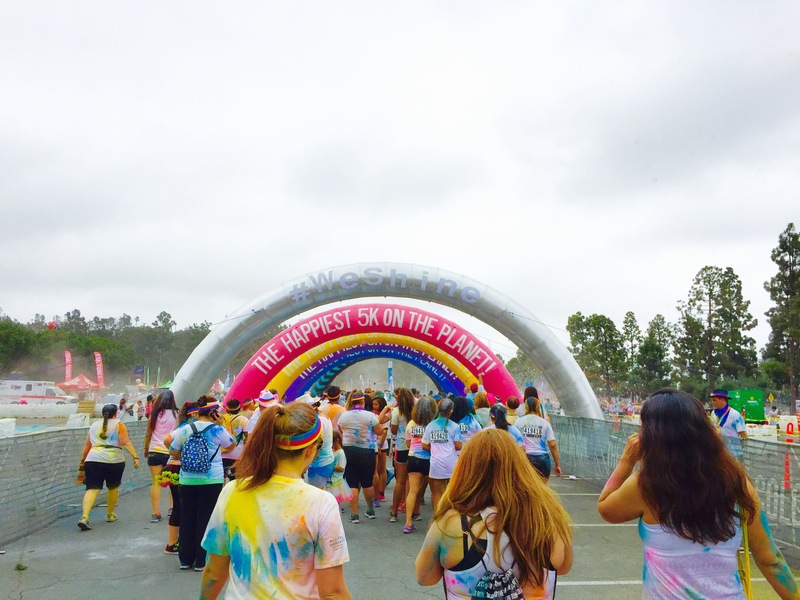 The location of the color run was at the Dodger’s Stadium in Los Angeles. There was a huge parking lot and it was free to park. 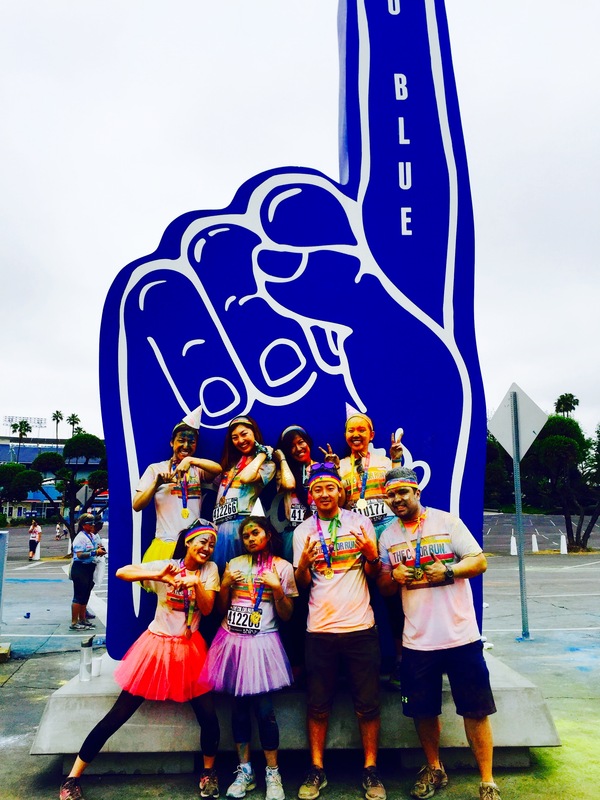 Here are before and after photos of the run in front of the LA Dodgers finger sign! 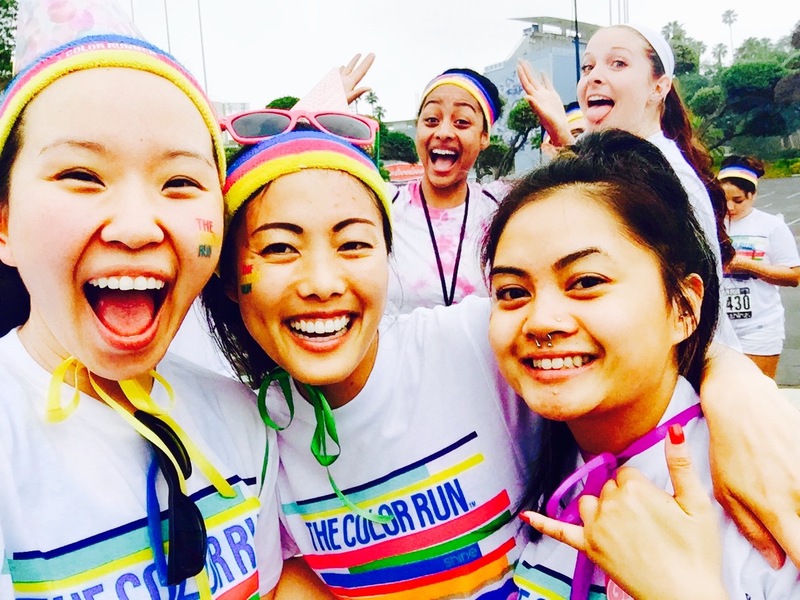 We look so much colorful after the run! By the way, we were wearing birthday hats because one of my friends’ birthday was that day. We got photo bombed before the run! Here are photos we took during the race! 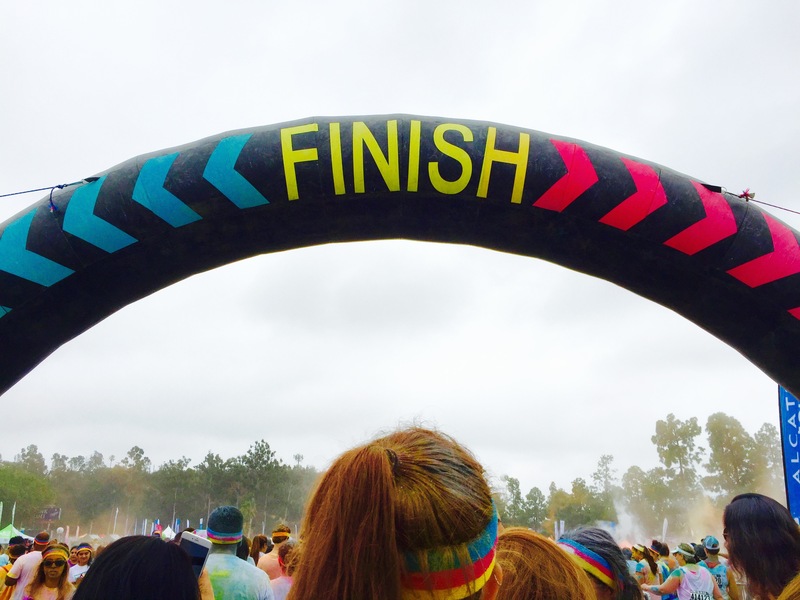 For each kilometer we ran, we went through a different color. 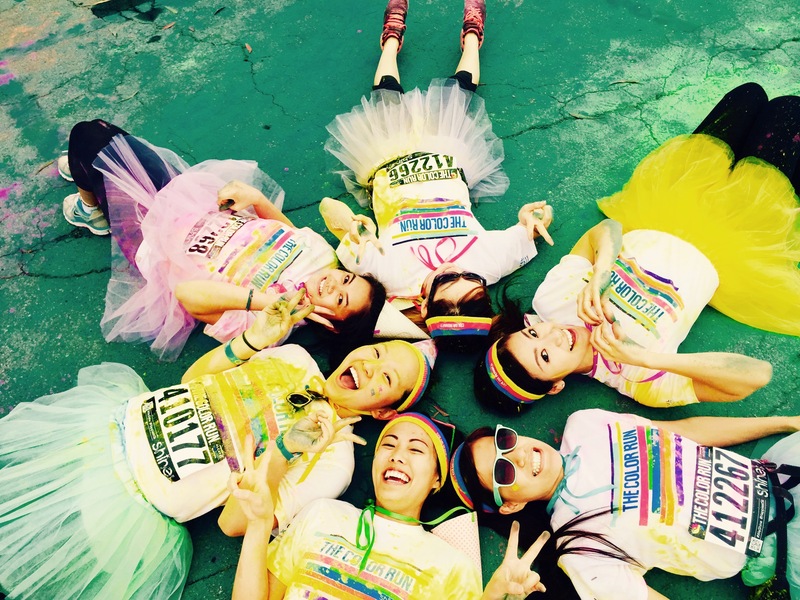 The first kilometer, we ran through pink, then yellow, then orange, than blue, and glitter to make our rainbow shine!!! 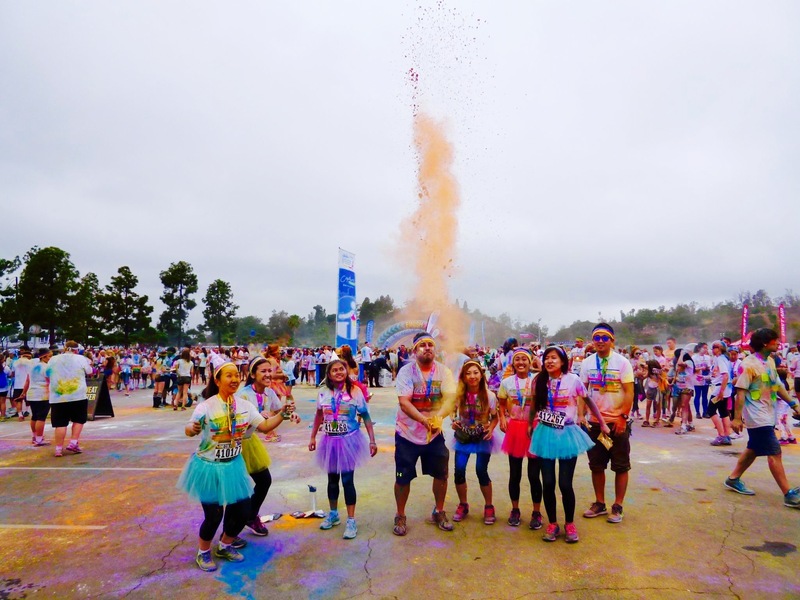 Although there were many people rolling in the colored powders and being asked to have color powder thrown on their bodies, I was trying to be a ninja and see how many times I could avoid being splashed with color. 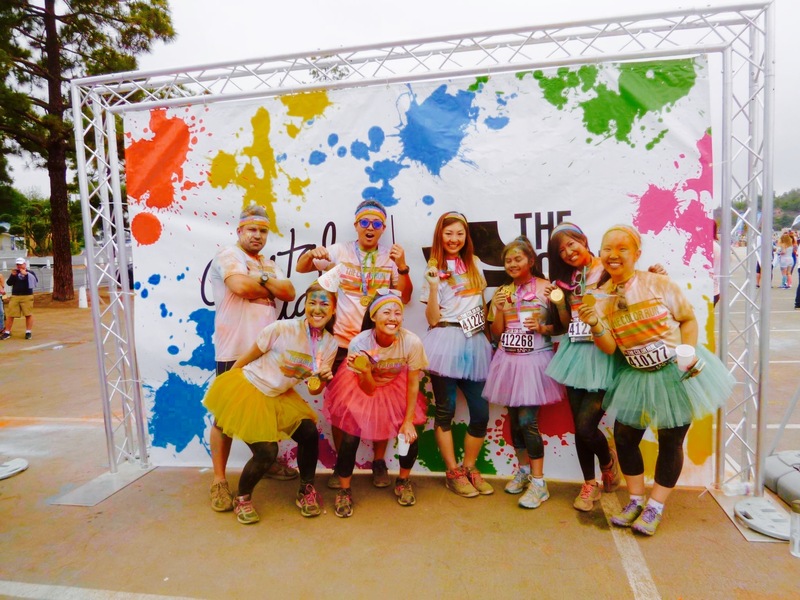 I know it sounds counterintuitive since the reason why people go to this run is to get covered with color. I guess I’m just strange like that. I realized that if you were shorter, you get sprayed more with color powder since the volunteers would pour it over your head. I was a bit worried about what the color powder was made of and my friend reassured me that it was all natural corn starch with food coloring. I didn’t want something unnatural and harmful to the environment being thrown around, so I was relieved. Here are photos for the last kilometer of the run. 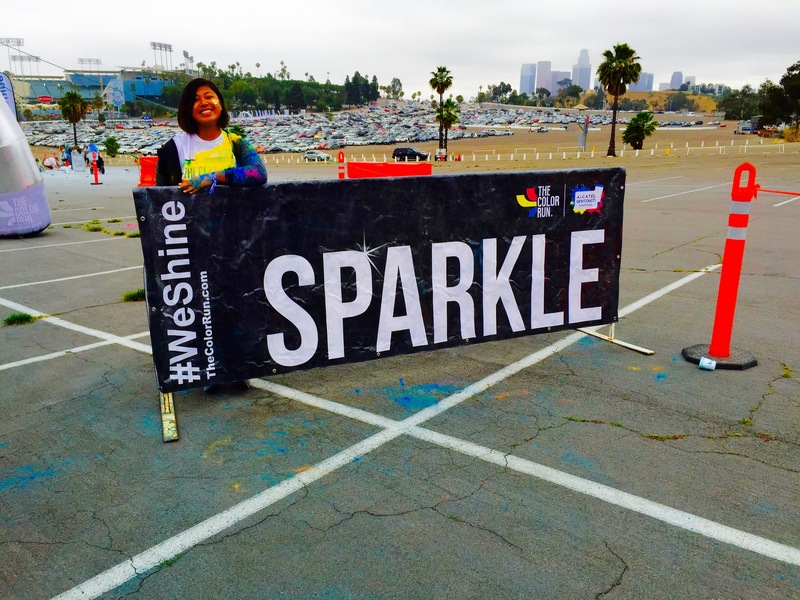 It is time to sparkle! I was a bit anxious about this last one because it was glitter and if you get it in the eyes, it is not a pretty sight. I witnessed most people wearing goggles or sunglasses and I believe that was smart because there was no way to have powder or worst glitter fall into your eyes accidentally. Thankfully, I had no eye infection after the race, which I was most fearful of getting. I did sneeze a couple times during the race because some of the powder went up my nose. After the race, we received a medal for our hard work having fun! We had a party throwing more color powder into the air and dancing to house music! It was so fun. I was a bit turned off by the amount of trash created from all the plastic bags containing the color powder that was given to us. I always feel uncomfortable when I see so much trash especially at these kind of events. I know it is expected since there are so many people, but I still have this urge to stop everything and pick up all the trash, but I knew it would be never ending. I know that they have a clean up crew to clean up the place, but I felt a bit guilty being part of the mess. Here are more photos after the race. There are so many places to take fun photos with your friends and family! 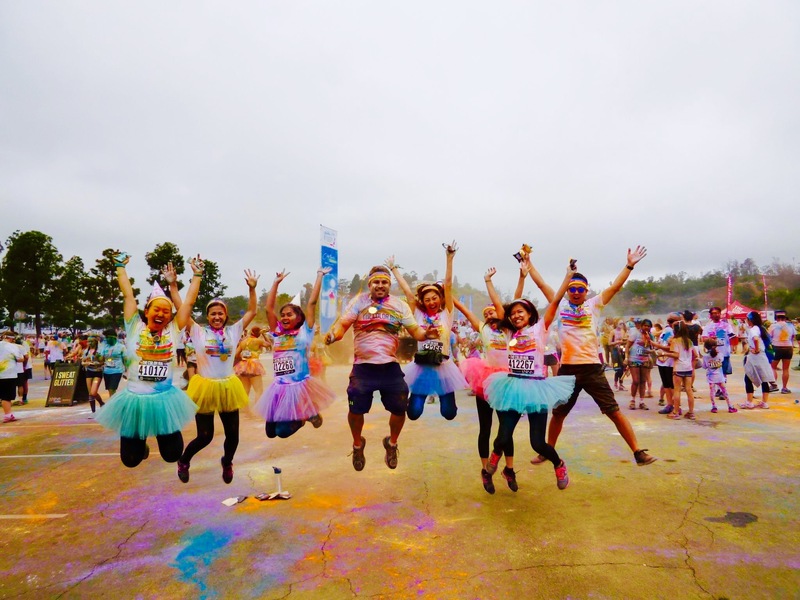 If you decide to go on the color run, make sure to bring extra clothes to change in before entering your car! I was fortunate to have a friend who knew what to bring because we would have ended up having very colorful car seats. We also brought with us towels, sandals, water to clean us off before getting into the car. The color power on our hair came off very quickly, but the color on our skin took a little more effort in scrubbing to rinse off. A day after the race, I still had color coming from my nose and ears. 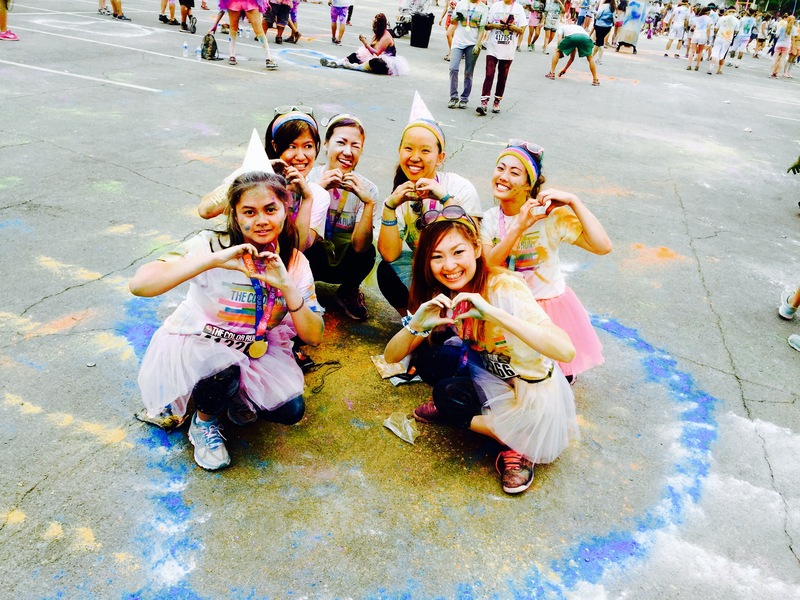 Overall, I felt that the race was worth every penny.Watch a youtube video of color run that we made using go pro here! 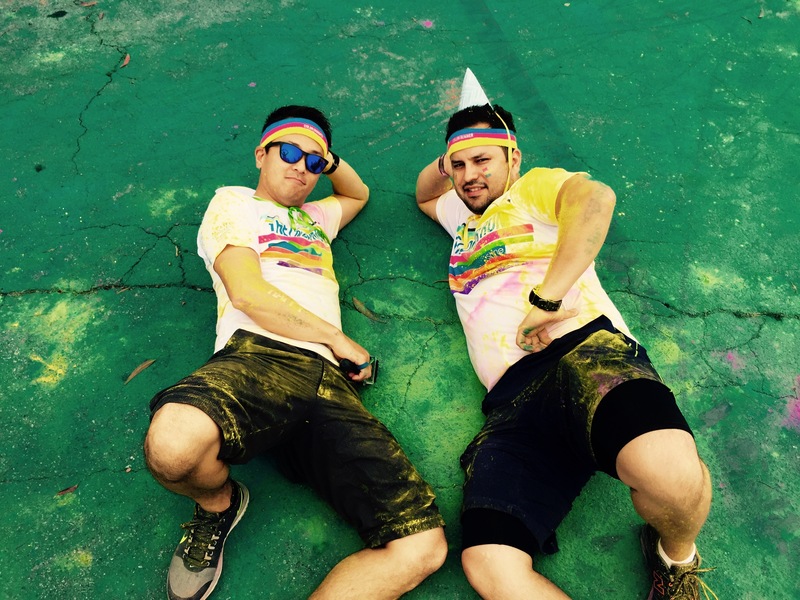 Color run youtube. 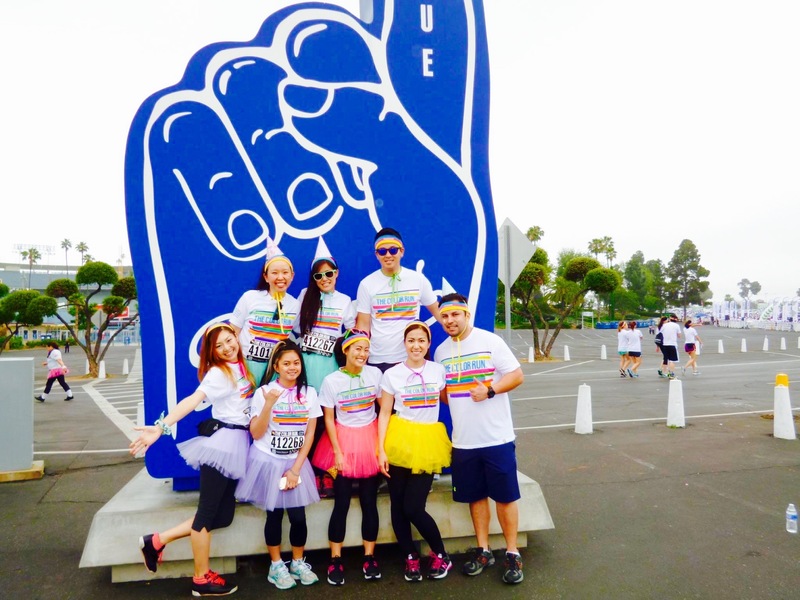 This entry was posted in Hobby and tagged color run, color run 5k, color run 5k 2015, color run 5k la, color run 5k tips, color run los angeles, color run pictures, the color run. Bookmark the permalink.